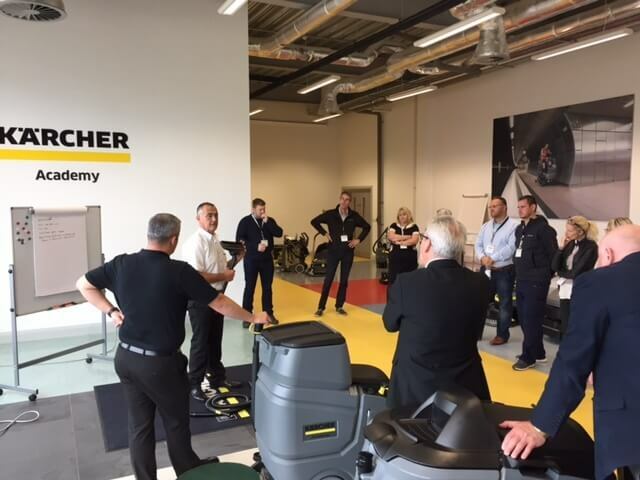 Cleansweep / Karcher Training Day…..
we were delighted to be hosted by our machinery supply partner, Cleansweep, at Karcher UK’s fantastic new head office facility in Banbury. A number of operational management, site managers and senior directors spent a very insightful and interesting day with Steve & Gabs from Cleansweep & Nigel, head of training at Karcher UK. Nigel has been with Karcher for 26-year and his depth of knowledge was immense and he was superb in sharing key facets of his knowledge and insight into achieving the best performance from our Karcher fleet. Everybody who took part in the day found it really enjoyable and we all took positives from the day – such was the success of the day that the next training day is being organised already!! Thanks again Steve, Gabs & Nigel – a true partnership at work! !